A garage door is the most vital part of every home and office and it should work every time, without fail. Just like any other appliances of your home, your garage door also requires regular maintenance to keep it running well. At Whitby Garage Doors, we recommend preventive maintenance services twice a year. We have a team of experienced and trained technicians capable of performing a complete inspection of the various moving parts. These parts make sure your door opens and closes safely, every time. There’s nothing worse than having an unexpected failure of the door, in such situation, you can count on our garage door experts in Whitby and Oshawa. Your garage door consists of around 300 independently moving parts. Our garage door technicians are well-versed with the different types of parts and their functionality. 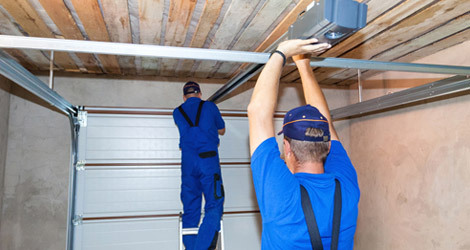 They can perform an in-depth inspection and service that keeps your garage door working smoothly for years to come. Springs break for many reasons, such as general wear and tear, due to change in temperature, improper adjustments or due to lack of proper maintenance. We are your local spring fixers, who can replace your broken door springs and improve the efficiency of your overhead door. If your garage door gets off track, it gets difficult to open or close as it is unable to move up or down. The reason behind can be a broken cable, but many other factors can hamper the functioning of the door such as bent doors, obstruction on the track and more. Our garage door repair experts in Whitby and Oshawa will get your door back to working order quickly and efficiently. When your garage door is off-track and unable to move up or down, make sure you don’t try to move the door and call us immediately. At Whitby Garage Doors, our garage door experts will resolve the issue in a timely and professional manner. For all your garage door issues, you can call our experts in Oshawa.